The Short Version: I moved VPN, home automation control, and video recording from an ASUS eeeBox PC (Windows) to my iMac (OS X Mountain Lion). VPN was changed from PPTP to L2TP using iVPN to control the server. Video recording is with the same program (Vitamin D Video Pro) using the same license. mControl was dropped and I’m now using Indigo 6 to control everything. For home automation control I’ve been running mControl over the past few years. The development team rarely updated the software but rather than invest in a different package I went ahead and upgraded to version 3 when it was released. The software was running on an ASUS system I had setup at the house for managing home automation and security video recording. Over the years I’ve managed to get by with mControl but it’s always felt a bit buggy and hasn’t always been especially responsive despite tinkering with it off and over the years. Integration with other software was relatively weak and even using command-line programs with it was tricky. On top of these various issues the Windows OS itself had a tendency to freeze up about once a month, which was an additional problem because it records video using Vitamin D Video as well as acting as a VPN server into my network. All of these issues compounded with the fact that my iMac was underutilized and I had a tendency to leave it on. As a result I decided to phase out the ASUS system completely and transfer home automation management and video recording to the iMac. I researched going the route of using an appliance instead of but I wanted to use existing hardware and none of the appliances really fit my needs anyway. I setup an L2TP VPN server on the iMac again and was able to re-use my Vitamin D Video Pro license with OS X. Setting up home automation on the iMac was a more expensive prospect. After reviewing several different products I decided to purchase Indigo 6. I’m not sure I would have made this move yet if they hadn’t recently added Z-Wave support (I have a mix of X10, Insteon, and Z-Wave devices). Everything is up and running and so far it appears to be working great on the iMac. I’m finding Indigo to be much easier to configure than mControl was. I’m also pleased to have a native application for server management, rather than dealing with a Web interface. Indigo provides a free iOS app for connecting to the Indigo server hosted locally on my iMac. It’s very responsive and the app works fine when connected over VPN when not at home (one of the problems I had with mControl was that the iOS app often didn’t load/change device states properly even though it appeared to work – a severe issue when I’ve left the house thinking that I had activated certain alarms). The entire transition and configuration of Indigo and Vitamin D Video probably required only about three hours and most of that time was dedicated simply to learning how Indigo works and testing my various devices, triggers, and schedules. So far, I’m extremely pleased with the setup and specifically with Indigo. I purchased the Pro version, which was a significant hit to my finances (just under $200) but if it continues to work this well then I’ll consider the cost well worth the time savings and reliability that it may provide. Updated 07/17/2013: I haven’t had any problems since I moved to the new software and to the iMac. In fact, I’ve experienced no problems so far. I’m very pleased with this decision. 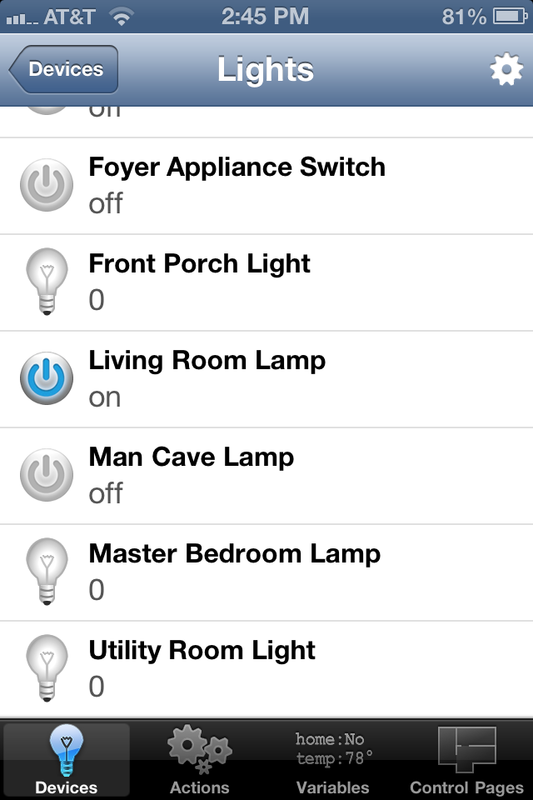 Updated 07/06/2014: Indigo is still working great for my home automation needs. I’ve had no problems caused by the software itself.